A weekend visit to Yuma offers both the charm of a small American town and a unique glimpse back to the days of the Wild West. Yuma has less than 100,000 citizens, though it is estimated its population doubles in the winter when the snowbirds come to town. Yuma has quite a mix of things to do that highlight its small town charms and Wild West history. If you’re looking to get off the beaten path, Yuma definitely fits the bill with the types of attractions that can only be found in a small town. The Cloud Museum began in 1989 when proprietor Johnny Cloud rented out his farm land and got stir crazy with nothing to do. He started collecting and displaying his collection on his property for his own enjoyment. People began driving by and stopping to take a look around, so he built a small fence and started charging $1.00. Then one day someone stole some gas pumps, so he put up a bigger fence and started charging $5.00. The Cloud Museum’s collection includes cars, trucks, tractors, tools, household equipment, and more, and the collection continues to grow. Johnny Cloud rattled off the numbers of his collection so quickly I retained practically none of the list except that there are Model As, Model Ts, and 99 of one of those, so while the sign says there are more than 110 cars, I’d say the number is much, much larger. Romeo could have literally spent all day examining the collection, and I had fun trying to identify all the random pieces of household equipment and discovering some I had never seen before. On the way from the Cloud Museum to the Castle Dome Mine Museum we passed through the Yuma Proving Ground. After agriculture, the military is Yuma’s second largest economic source. The Yuma Proving Ground is part of the United States Army and is one of the largest military installations in the world, used for testing military systems and equipment. Yuma is the perfect location for such a large test range because of its big empty spaces and the fact that it holds the Guinness World Record as the sunniest city on earth, meaning tests can be run year round. Along the road are random pieces of military equipment like a helicopter, tanks, and missile launchers. While Rome could have spent all day at the Cloud Museum, the Castle Dome Mine Museum was my favorite. Castle Dome was a silver mine and the town was bigger than Yuma in 1878. The mine was in operation from 1864 to 1979, when it closed because the price of silver plummeted and the process of mining silver was no longer profitable. Castle Dome City had small beginnings with a brush house, an adobe house, two tents and two fenced lots. Over time it gained a school, five bars, two stores, a church, a sheriff’s office and jail, a blacksmith shop, and family homes. Today Castle Dome Mine Museum contains what is left of Castle Dome City’s buildings. I loved being able to explore these remnants of the old Wild West. The ghost town museum is located in the middle of Kofa National Wildlife Refuge and is reached by following a gravel road for a few miles, with nothing around but desert. There are two sections to the museum. The first has the highest concentration of buildings very close together, while the other has a few buildings spaced out with a dirt trail to follow which also passes the Castle Dome cemetery and leftover mine shafts. Festivals and Rodeos and Shootouts, Oh My! In addition to the always available things to do in Yuma, Yuma is constantly hosting special events. On any given weekend there can be five to 10 special events occurring around the city and outlying areas. We visited over Martin Luther King weekend and attended three special events just in one day. Feeding into the small town vibe of our weekend getaway, we visited the neighboring town of Wellton, about 30 miles east of Yuma but still part of Yuma County, to attend the Wellton-Mohawk Tractor Rodeo. The tractor rodeo, sponsored by the Foundation of Yuma Regional Medical Center, is held every third Saturday in January and 2015 was its 37th year. The tractor rodeo takes place at the Wellton-Mohawk Irrigation & Drainage District grounds and feels very much like a small town county fair. We sat on bales of hay and watched the Antique Tractor Pull, a display of the power of classic and antique tractors. Restored tractors line up and take their turn at trying to tow a tractor pull sled down the entire length of track as a weight shifts forward to make it heavier and heavier. The goal is to make it to the end of the track without the weight becoming too much for the tractor, making its wheels spin in the earth when forward movement has halted. In addition to the tractor pull, there are rides for the kids, antique car and tractor displays, old engine displays, live music, a biscuit and sausage breakfast, and a barbecue beef lunch. We next headed out to the N.R. Adair Park shooting ranges, 15 miles east of Yuma, for the Territorial Prison Breakout, which has been put on by Yuma MatchMasters, Inc. for the past 20 years. I’m not really into guns, but I am really into competition and skill, and by the time we left the match I was almost ready to sign up with the SASS (Single Action Shooting Society). The Cowboy Division, or Colorado River Shootists, is a SASS affiliated club and holds monthly matches, but the Territorial Prison Breakout is a two-day annual match that is held every Martin Luther King weekend. 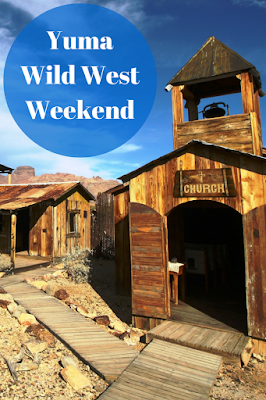 The shooters dress up in their old western wear and shoot old west firearms on a course of different shooting stages which are set up with old Wild West props like saloons, livery stables, and general stores. Spectators are welcome at the matches as long as they wear eye and ear protection. At first we felt a little out of place, but as we watched the matches there was always a club member or two who wanted to engage us in conversation, explain the rules, and answer any questions, and a few even tried to recruit us to join the SASS. The thought of shooting at targets while dressed in western gear is very tempting, and the activity was perfectly suited for the Arizona desert. For the fourth year in a row Das Bratwurst Haus hosted German Fest on Madison in Downtown Yuma. German Fest is a small block party with German beer, German food from Das Bratwurst Haus restaurant, German music, dancing, and activities for the kids. It’s a small festival spanning two blocks and attracts people of all ages who want to have a bite to eat and a little entertainment. We had such a great time visiting quirky museums and attending the types of events that aren’t easy to find in a big city. 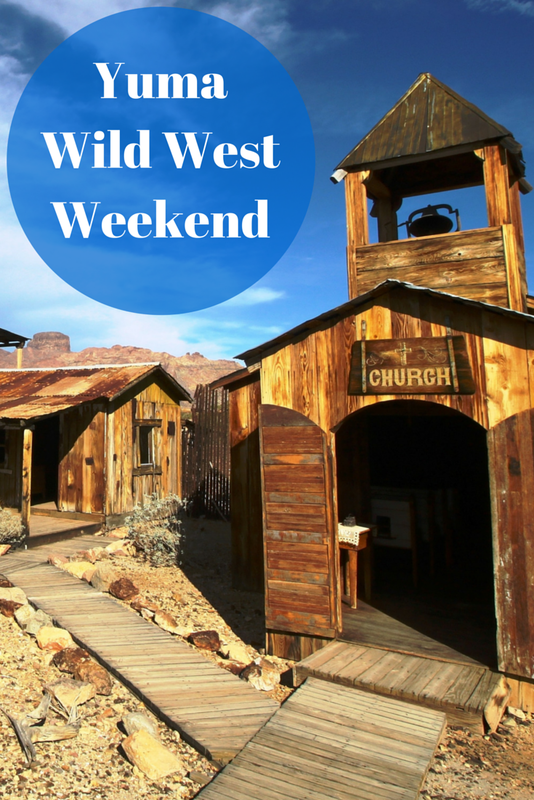 Yuma’s eclectic mix of attractions and events allow visitors to experience what it’s like to be in a small town with friendly people and a Wild West past. Thank you to the Yuma Convention & Visitors Bureau for hosting our trip to Yuma and making this post possible. As always, all opinions are my own.